The Office of Hearings and Appeals expects the Navajo Elections Administration to replace Chris Deschene with the candidate who received the next highest votes in the primary elections. The election board, which met Thursday afternoon, declined to take Deschene’s name off the ballot at this time, according to a written statement issued by the OHA. Russell Begaye received the next highest votes, with 7,453, during the primary elections held on Aug. 26. "OHA expects NEA to place the candidate with the next highest votes as the new candidate on the official ballot in the general election," stated OHA. "All parties shall have ten days to appeal this final order to the Navajo Nation Supreme Court." In an earlier interview after the OHA ruling regarding his refusal to answer any questions, Deschene said he that it went back to the language. “The language should never be a measure to divide and separate our people,” Deschene said. “Look at the administration, the leaders that have come before. Did they make language a priority? I would argue no because in my campaign, what I said is to preserve and protect our culture, and amongst that is our language." “I respect the court’s decision, but I really think that the votes of our people have kind of taken a backseat to what’s happening right now, “ Deschene added. During Thursday’s hearing, Deschene repeatedly refused to answer any of the questions asked by Justin Jones, attorney for Hank Whitethorne. "Háádę́ę́' lá naną́? (Where are you from? 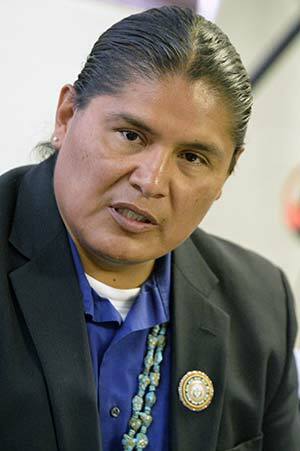 )” Jones asked in Navajo after Deschene was sworn in. Deschene responded by protesting that the questions were unfair and devised by Jones and his client. Jones then asked Deschene, in Navajo, where he was from again. "Éí nashín'taah doo ákót'éedah (You are testing me. This is not right),” Deschene responded. Jones moved onto the next question, “Haadóone'é shą' nínlį́? (What are your clans)." And again, Deschene responded with, “Éí nashín'taah doo ákót'éedah." Jones moved onto the third question, asking Deschene in English to describe in Navajo, how a resolution is made into law in the Navajo Nation government. Deschene repeated his previous answer, saying he was being tested and it wasn’t right. At that point, Jordan kept pressuring to force Deschene to answer the question. After several attempts, Nez said he had no choice but to enter a default judgement. Deschene has 10 days to appeal the decision.